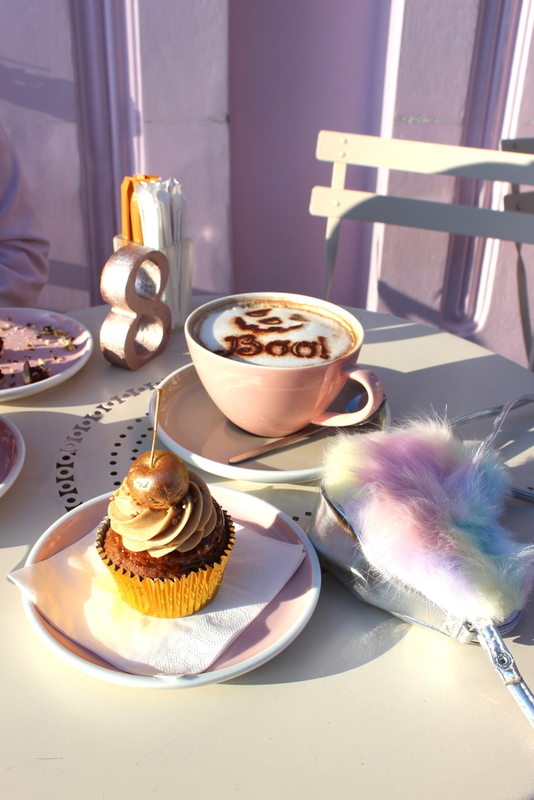 Earlier in the week mum and I ventured to one of our cake dates at Peggy Porschen. 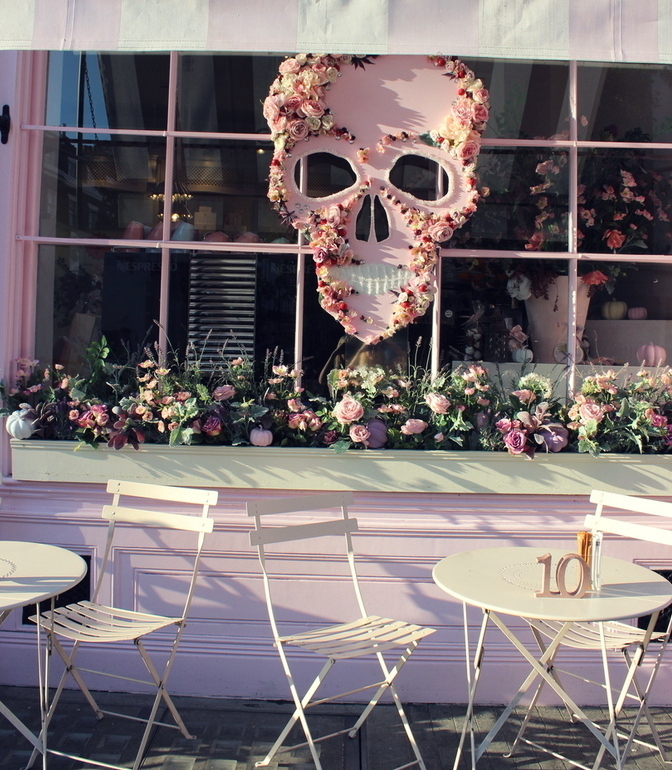 We'd been excited for this one in particular seeing as Halloween has hit the cafe and turned it into a spooktastic pink parlour. 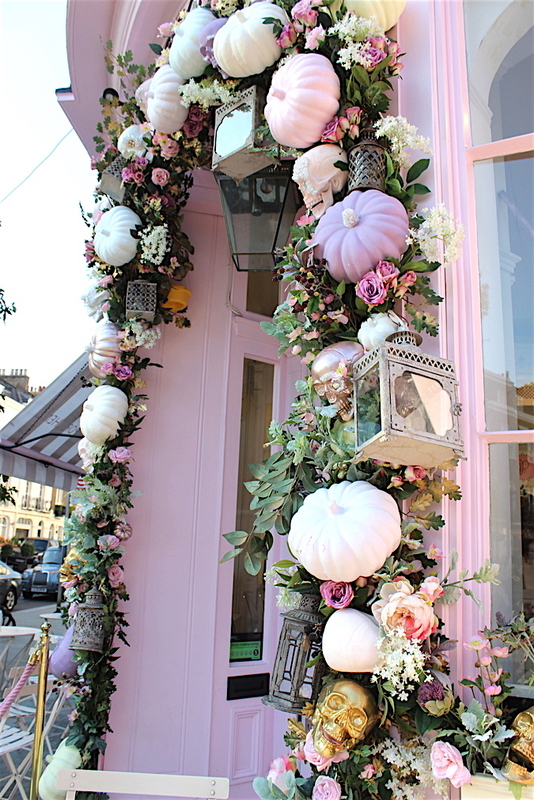 The Halloween decor at Peggy Porschen is dreamtastic to say the least; a massive floral skull adorning the window, purple and pink pumpkins arched along the entrance and brooms, flower power and magical sweet treats to conjure up all the cosmic cuteness any pink babe of bliss could wish for. I wasn't intending to blog about our visit but I took my camera this time and decided it would be the perfect time to post this festive Halloween cake date here on the blog for a little bit of Halloween heaven. 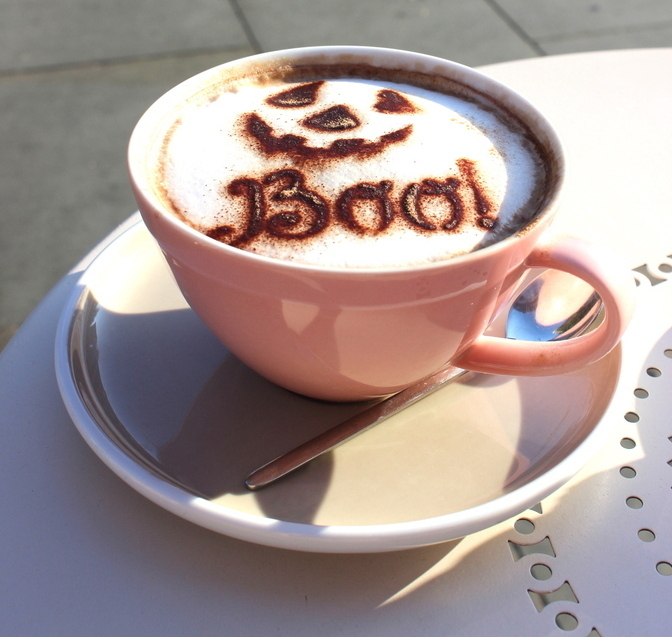 As always the latte art was funktastic and for mum's latte she was given a pumpkin face (she couldn't wait for me to take photos, she broke the rules and sipped at hers before I caught it on camera), while my hot chocolate was given a Boo theme. Too cute! I also chose a Golden Apple & Chai cupcake but I was totally eyeing up the skulls & pearls one they do too, so pretty and festive. Mum got a bit impatient as I took 1234567890 photos on my camera and phone but by God was it worth it for the instagrammable dreaminess! Despite having visited Peggy Porschen a couple of times now, I've never really managed to get decent outfit shots of me there so during this visit I decided to dress to match the dreamy pink decor. 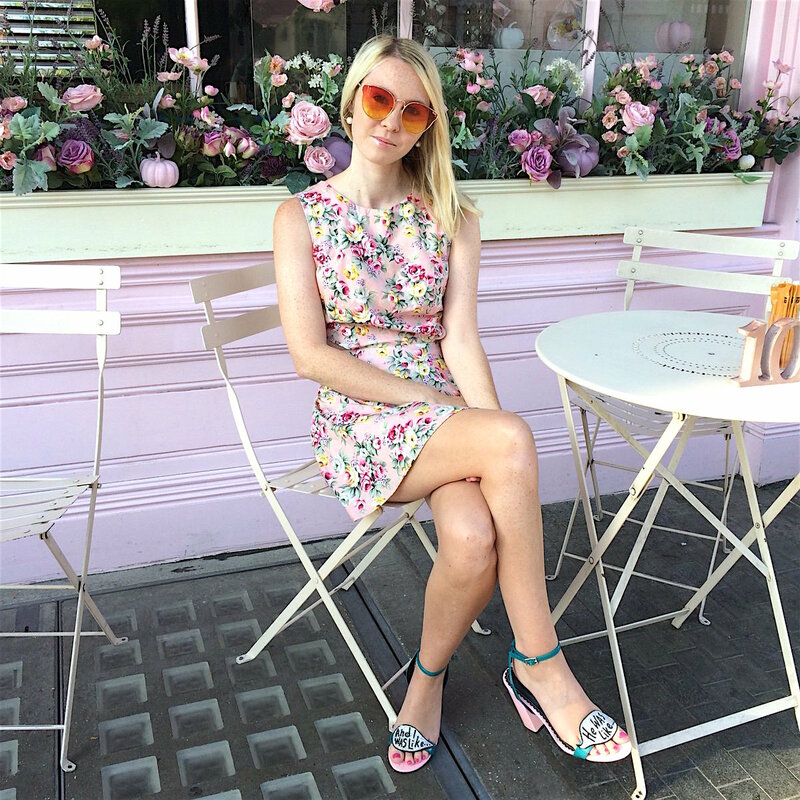 I unearthed this gem of a pink floral dress from my wardrobe which I'd forgotten all about and was thrilled with how it matched against the Peggy Porschen decor. I also got to take my brand new fluffy pink ombre heart-shaped bag out for a ride. This is from Accessorize and admittedly the kids section, because do you know what? Their adult bags aren't half as fluffy and sassy. I know I've mentioned this before but I'll say again how friendly and sweet the staff at Peggy Porschen are. The guy serving us greeted us with a massive smile and as always we were made to feel welcomed and given a lovely experience. I'm so glad it was a sunny day and as always it was perfect. As is always the case after Peggy Porschen we got straight back on the train which is the perfect amount of time in London for me. 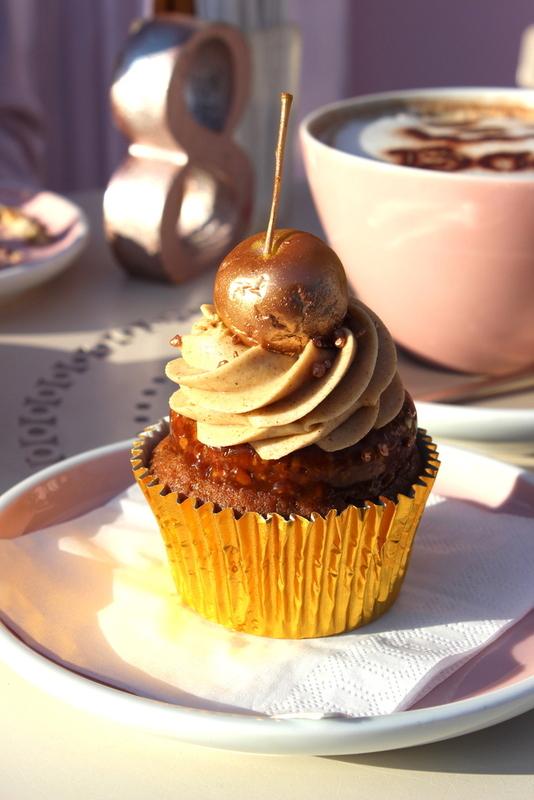 I'd love to try some more of the London cafes now I'm getting more confident with London but I have a feeling Peggy Porschen will always be my favourite. It always offers up such a unique and cute vibe, it's a truly special place and if you have the opportunity to go then it's truly worth it. 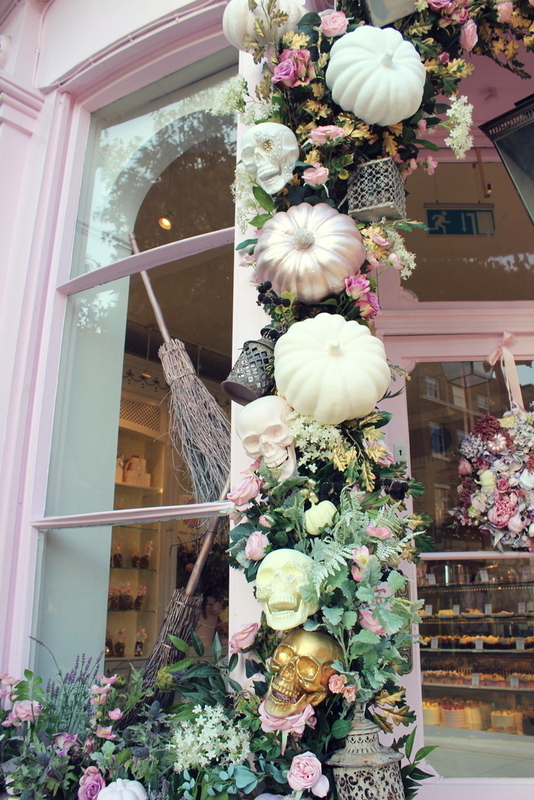 Have you ever been to Peggy Porschen? Do you like their decor? Do you have some favourite London cafe recommendations? I'd love to know! 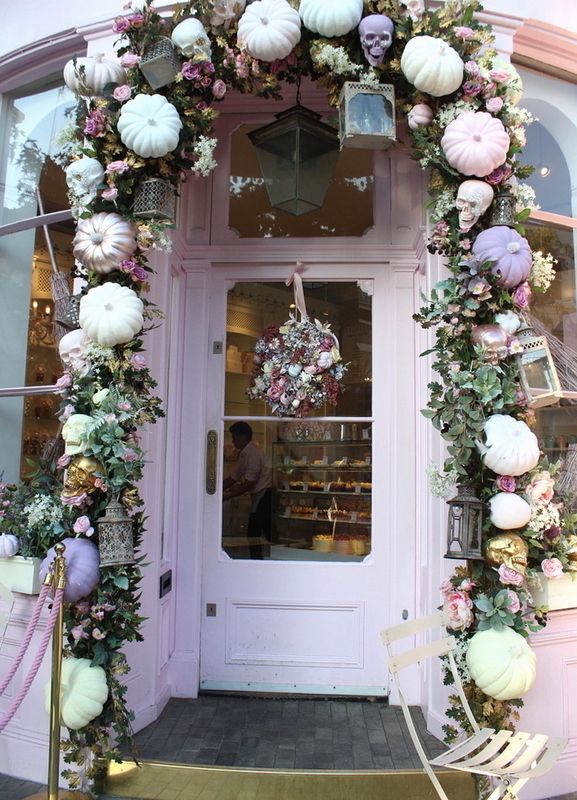 Peggy Porschen is a place I've always wanted to visit, I love all the pink! The cakes look incredible too! Oh my gosh these are amazing photos - I am so jealous! This looks like such a fun experience :) I am in love with the Boo design! Thanks for sharing! Amazing! Definitely gave me a little slice of all the magic! Prettiest in pink Halloween! 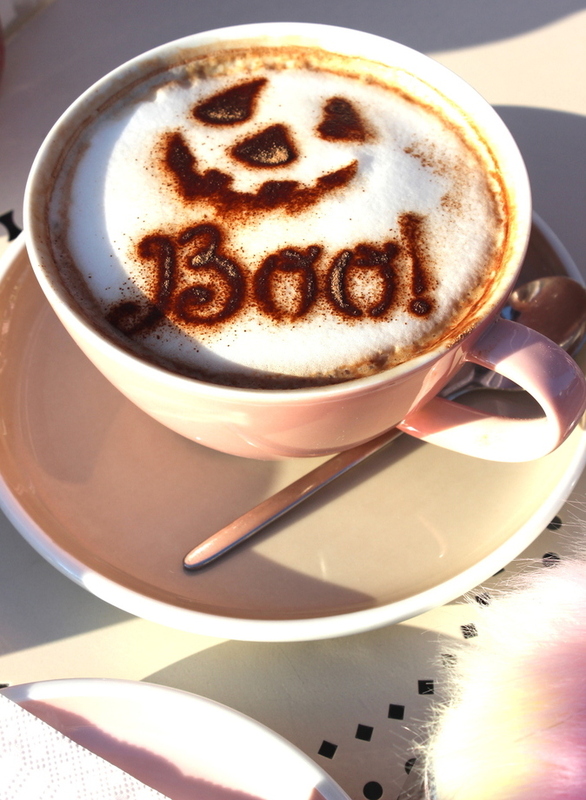 That coffee looks so cool! 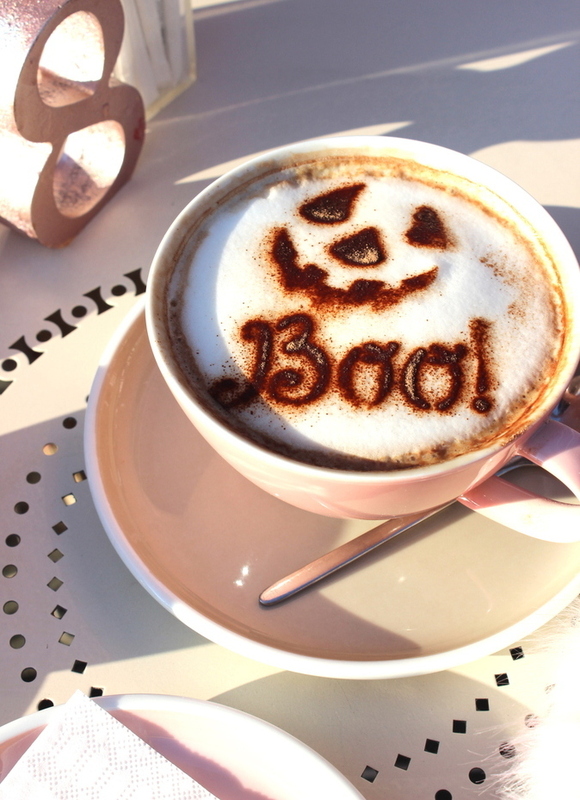 I love the Boo on it. It looks like such a pretty place all decorated too! This spot looks so cute! I'm especially in love with the way they've done up that hot chocolate! I so badly want to go to Peggy Porschens, the colour palette is just up my alley and all the cakes look and sound amazing! 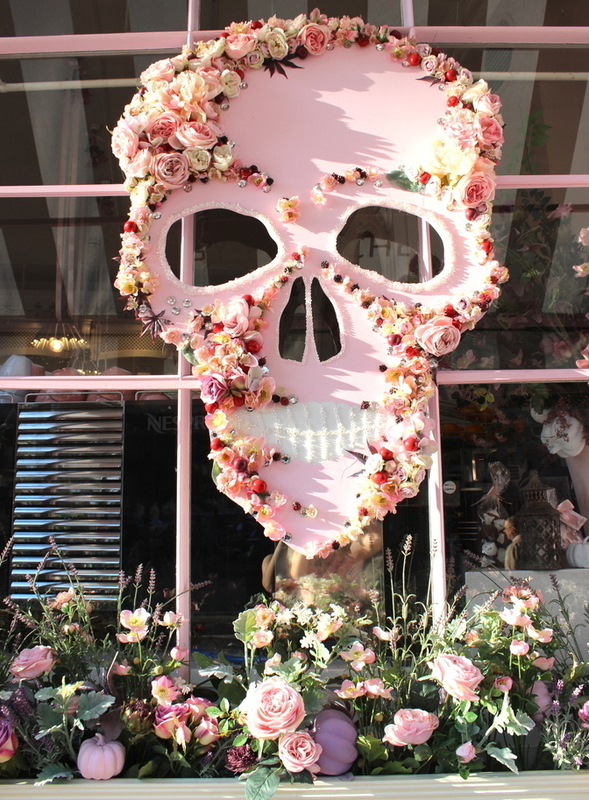 I have not been to Peggy Porschen before, but it sure is an Instagram favourite. You look so good in that happy dress my dear Sophie. Hope your week is going well. Aww this is such a pretty and feminine post babe! Your outfit fits the location perfectly and has also served as a reminder to me... I've never been to Peggy Porschen before! 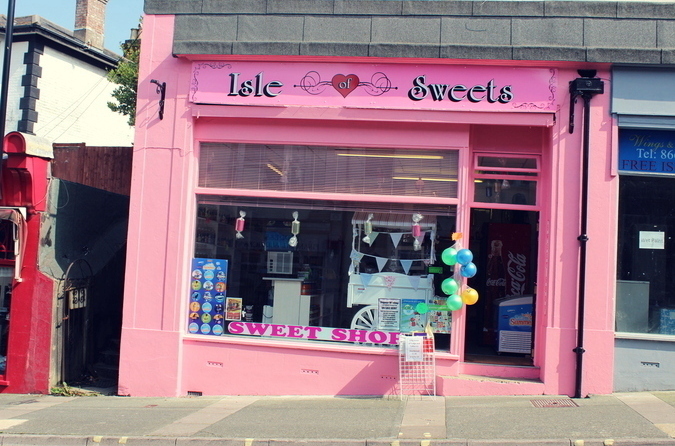 I can't believe I haven't yet got around to visiting haha; got to get a slice of that famous cake at some point :) I adore how they switch up their decor each season!! 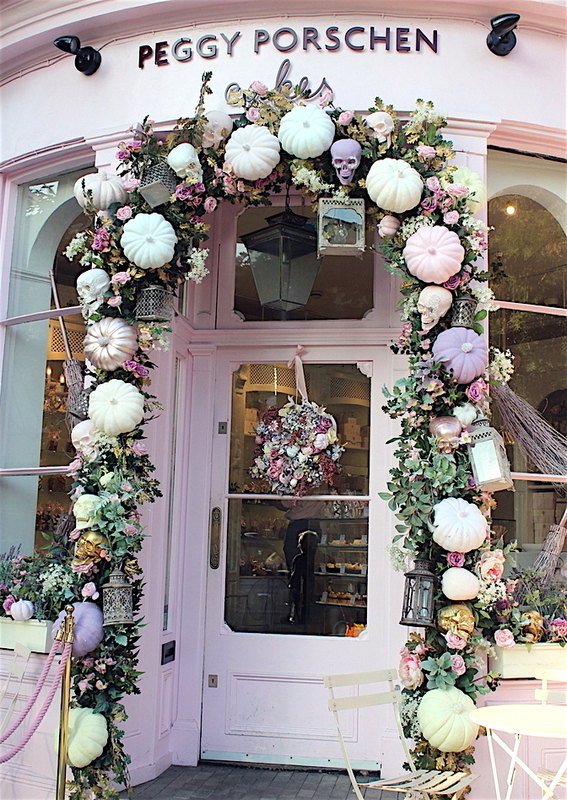 I know Peggy Porschen only from Instagram and think when I'll visit London it will me my first station. But your photos and this Halloween decoration are breathtaking. So original, unique and different from other places. 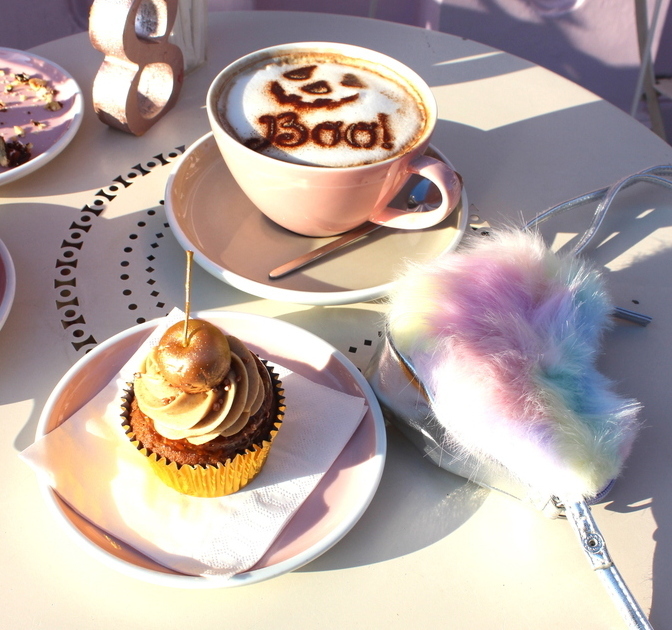 Everyone have normal pumpkin but this are pastel are so cute. Also your outfit is so beautiful and match with interior. I really like your dress, bag is cute and your sunglasses are amazing. Last thing is cake and coffee, I can't stop watch them. They look so delicious. Thank you for this post. Wish you amazing end of week!